Pork Belly Buns Recipe Taiwan Style - Pork recipe is for Christian religious people not for Muslim so if you are Muslim then ignore this recipe. 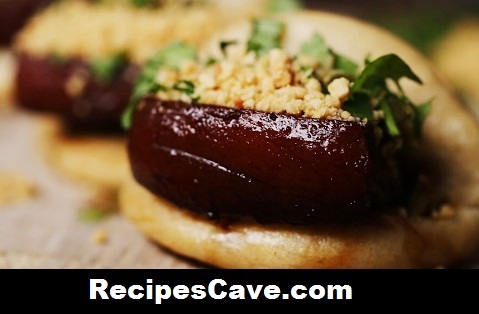 Here is what you'll need to cook Pork Belly Buns Recipe for serving 10 peoples. In a measuring jug, place the sugar and warm water. Stir until the sugar is dissolved. Add the active yeast, then stir and set aside for 10-15 minutes. Add the yeast mixture to the bowl and stir until nearly combined. Add the oil, then stir until fully incorporated. Turn the dough out onto a floured work surface and knead for 10-15 minutes. Once the dough is smooth, return it to the bowl, cover with plastic wrap, and leave for 1 hour until the dough has doubled in size. Remove the dough from the bowl and knock it back by kneading for 1 minute. Roll each piece into a ball, place onto a lined baking sheet, cover with plastic wrap and rest for 10 minutes. Onto a floured work surface, flatten each ball with the palm of your hand. Roll out to 2 millimetres. Lightly brush one side with sesame oil, then fold in half and place back onto the baking sheet. Cover and rest for 20 minutes. Set steamer over a high heat, then steam buns for 8-10 minutes. Slice the pork belly into 1 inch-thick pieces. Fill a large pot with water. Put in the pork, spring onion, ginger, and cooking wine. Bring the water to boil. Drain the pork and discard the remaining water and vegetables. Clean and dry the pot. Return the pot to a high heat and add oil. Fry the pork until it browned. Add garlic, spring onion, ginger, sugar, five spice, cooking wine, and dark and light soy sauce. Stir until all the ingredients are well combined. Add the water, stir, and cover. Reduce to a low heat and simmer for about 45 minutes to an hour. Check and stir every 10 minutes or so and add water if the pot is getting dry. Fill one bun with one slice of pork, top with coriander, pickled cabbage, and roasted crushed peanuts.